Here I will show you how to get at least 3.5% more money when you withdraw. It’s quick and easy to do. It’s a guaranteed way to increase your income and with very little effort required. 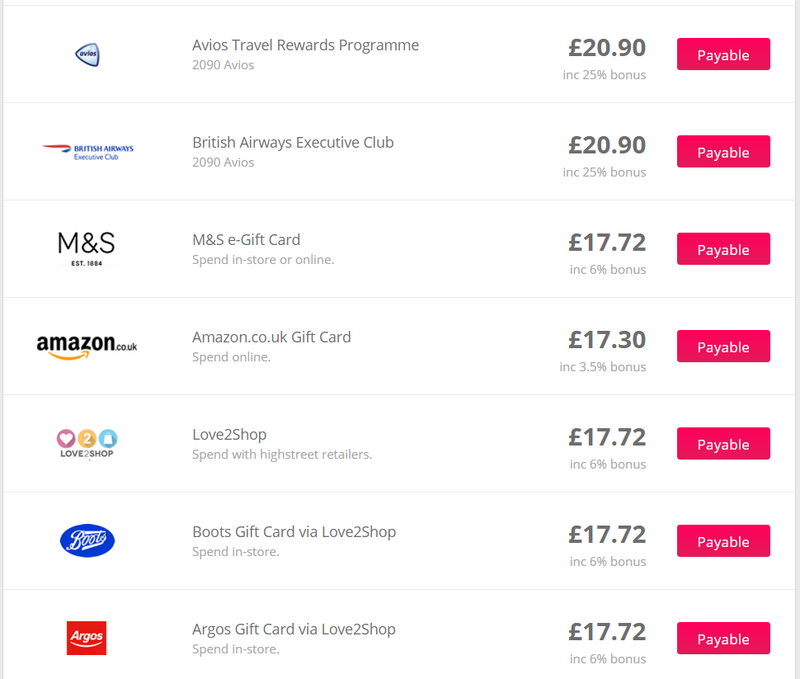 The most popular website to use is currently Topcashback. Hundreds of companies give you the opportunity to get more pounds into the bank. But there is one little thing you can do to increase the total cash back you get even further. When your money is withdrawable you get a choice of methods of how to receive your cash. This is where this little trick comes in. There are a variety of ways to receive what you’re owed. Here I will share some screenshots to demonstrate how you can use this opportunity in your favour. I currently have £16.72 that is withdrawable. 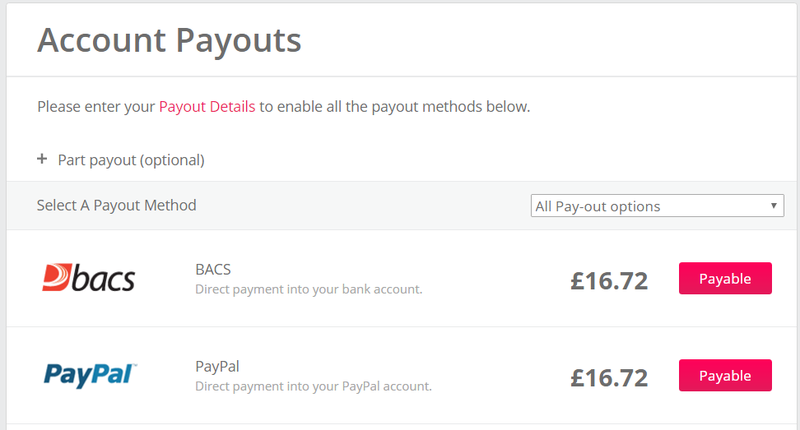 If I use BACS or Paypal that is what I’ll receive as you can see here. But there are often other choices too. This is where the opportunity to get extra money comes in. You just have to make sure you’ve planned ahead. For example you’ll get extra cash if you pick retailers like Amazon, Boots, or Argos. By taking advantage of this it means the total cashback you willeceive will be higher compared to the original percentage you thought you were getting from retailers. There isn’t much point picking Amazon or one of the other retailers just for the sake of it. You actually need to have something to buy for it to make sense to do this. That’s where planning ahead comes into it. Think of things that you will need to buy in the coming months. Whether they be household goods or clothes or whatever you want. Leave the money in your Topcashback account until you are ready to buy those things. Perhaps you could wait until a sale will be happening! Once you’ve reached the time you’re ready to buy then take advantage of this opportunity to get the most amount of money. This is a great way to boost the value by at least 3.5%, all the way up to 25%! If you want to make sure the total available to you is as high as possible remember to also complete as many offers for the online slots websites as possible. Don’t just read about this and not take action, it’s your turn to act right now! If you aren’t a member of Topcashback then join now for free and get racking up the cash. If you are then login to your account and explore the potential of what you could buy and plan ahead of how you will withdraw. Do it now! If you are are a regular cashback hoarder (if not, why not?) then remember to also take advantage of competitions that TCB run. They don’t have them very often but they give out some great prizes. This could boost your earnings even more if you’re lucky. If it helps I previously also recorded a video with a little tip on how to take part in the competitions in a way to give yourself the best chance of winning. You can watch the video here. Save this for later to one of your Pinterest boards.